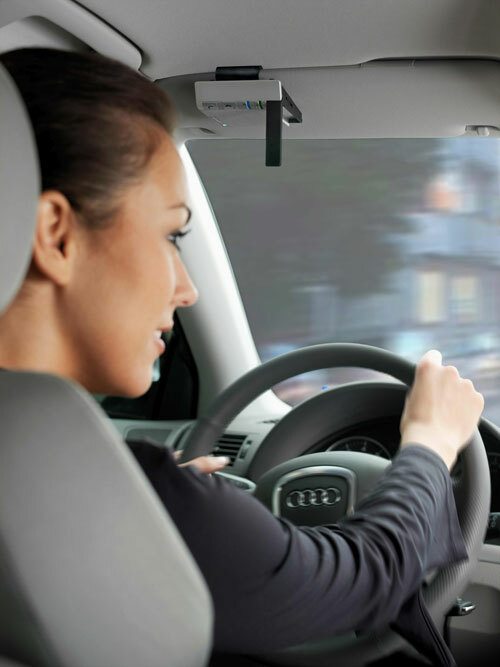 There is a big amount of car kit devices that provide ability to use your mobile phone, have conversations, without requirement to go to Service center of your car and have it installed. The first generation of such devices was using power from the cigar lighter, afterwards kits that were attached to the car part shown on the photo, the advantage of such method is clear – it can be easily detached and moved into office or home in order to recharge the battery. Another function of such device was introduced, it can be used to provide loudspeaker for phone calls in offices, and even though cars were the priority, it just isn’t the only use anymore. 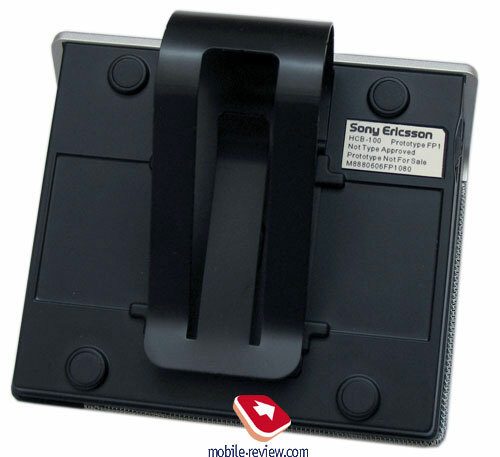 Sony Ericsson decided to stay away from inventing the wheel again, by simply following what other manufacturers were doing – SE created car kit Bluetooth set HCB-100. 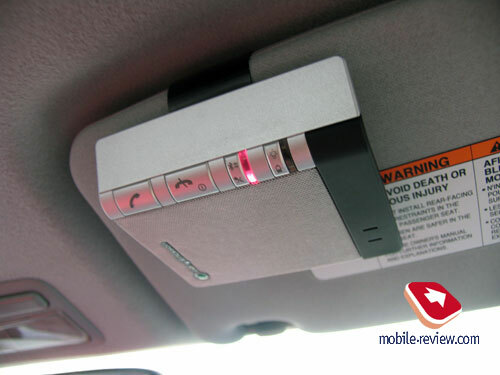 It can be attached to sun-protective shutter in the car, or simply put on the table in the office. The device looks quite fascinating, its small silver-covered box. The main surface = loudspeaker, which is covered with fabric grid, and looks rather nice. Special metal clip is part of the package, it is placed into back part of the device, it is used for placing device in the car. 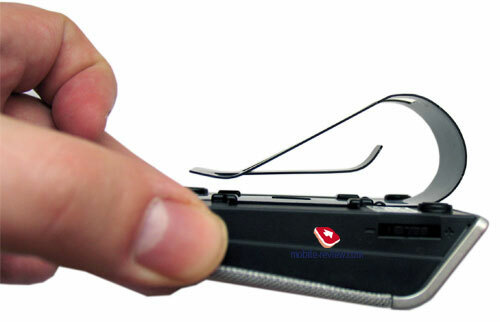 The clip is very tight, and it will be rather hard to remove it quickly, that’s why you should think a little before buying this device, in case you were planning active home-car-office swapping. HCB-100 has standard interface connector named Fast Port, but there isn’t even a charger in the package. 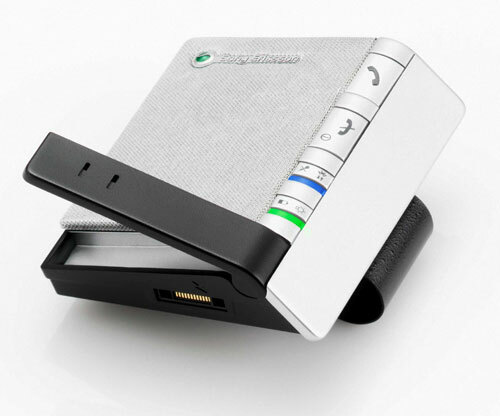 Manufacturer states that the device can work up to 20 hours in talk mode and up to 25 days in stand by mode. We were testing this device in quite moderate usage, during Russian winter. HCB-100 worked for about a week as average term, with around 3 hours of phone calls within that period of time. Presence of system LEDs can be noted as pleasant highlights. One is traditionally used for showing battery level, green means that the battery is fine, meanwhile red shows that you should recharge it. The other LED shows which phone is connected at the moment. There can be up to 5 phones bound to HCB-100, unfortunately they cannot work at the same time. The user should choose the phone that he wants to be connected with car-kit, this is made by pressing the special key, different LED color will be a confirmation of such action. The connection is made within 1-2 seconds. Bluetooth version is only v1.2. It would have been far more convenient if the device could check the phones in order, and whenever one of them had an incoming call, car-kit would connect to it. But dreams remain dreams. The manufacturer states that DSP is present here, this technology is used for noise suppression, removing the echo-effect. Considering the fact that this device, just like many others of a kind do not support full-duplex connection, the quality of voice transmission reminds of a walkie-talkie. Interlocutor often think that you lost network coverage, ask you if you are still on the line. It’s kind of hard to feel at ease during phone call, unless it’s a monologue. Each time you are having a phone call, and it reminds more of a dialogue than monologue, you start thinking was this device worth buying or no, it’s really hard to communicate in such way. 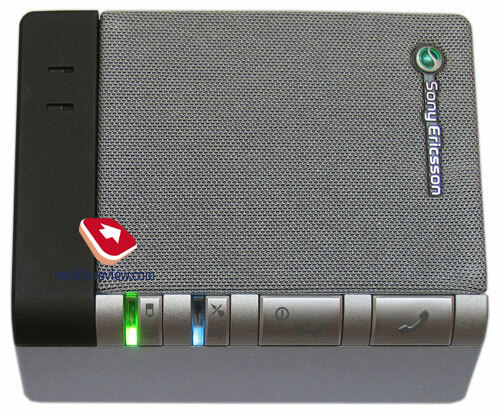 In the end we have a pretty good device in terms of design and functionality, but lack of full-duplex connection ruins everything. This is the main drawback which does not allow me to say that this model can be used by most potential buyers. It’s better to spend some time and install fully-functional car-kit set, which supports full-duplex connection. I’d like to point out that this is a common problem for such kind of devices. HCB-100’s price will range from 120 to 160 USD depending on the country. It is supposed to be released this Spring.